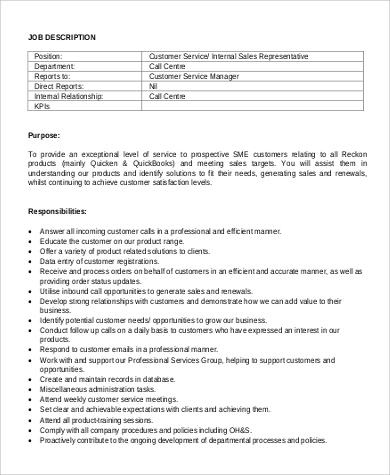 To be thoroughly successful in promoting its products and services, a company has to have several sales representatives to promote and sell its products. Products ranging from medicines being developed by pharmaceutical companies to food products, appliances and household products and services have employed sales representatives to showcase their products. That’s how relevant to the company sales representatives have become. 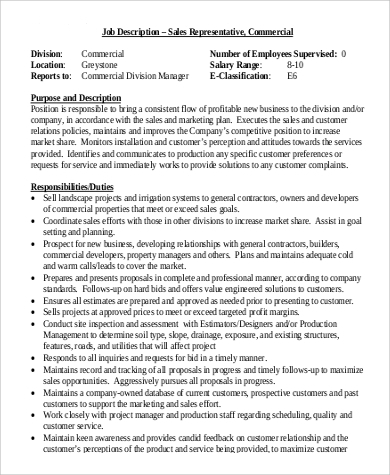 Our Sales Representative Job Description Samples can be used by companies in a wide array of products to hire potential applicants needed for the job. These are available for download and can be edited and modified to fit a company’s specifications. These can be downloaded in either Word Doc or PDF file. The primary objective of each company to hire sales representatives remains that of increasing the sales volume of its products. A sales representative can only be relevant if the results of his endeavor translates into better sales for the company he or she is representing. That means a sales representative must be sales savvy by having great communications skills and being adept at determining what the customer needs. Know Your Product. 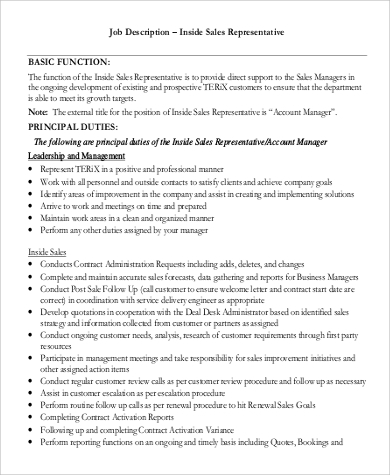 That theme has been emphasized time and again when sales representatives go into training. Product knowledge is the most important thing when selling something, otherwise how can a representative answer queries from a customer when he or she does not know anything about what is being sold? Some companies may encourage specific sales tactics that fit the products they are producing, and some even train representatives on the way they want products to be sold. 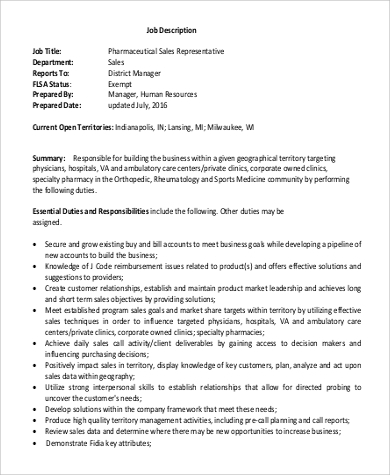 Our Sales Representative Job Description Samples will further explain the tasks, duties, and responsibilities of a representative. 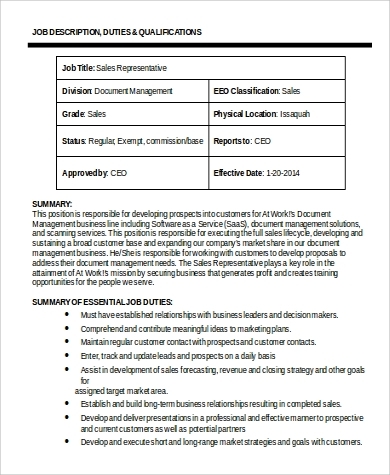 Companies will be able to distinguish which characteristics they need and modify the descriptive tasks according to their own specifications and conditions of hiring a sales representative. 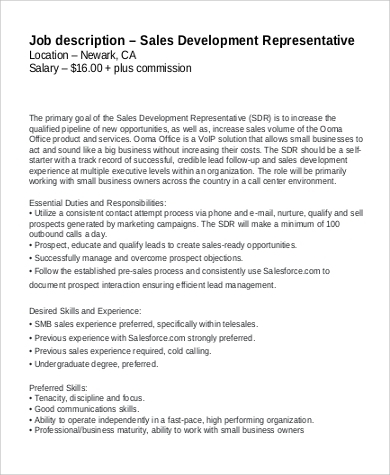 Depending on the kind of product a sales representative is applying for, he may go door to door or sell by asking for appointments. Some sales representatives work in call centers and call customers by phone in a telemarketing scheme. Depending on the company, some offer hourly wages plus additional incentives if representatives meet and exceed the sales target. Smaller companies only offer commissions for every product sold. 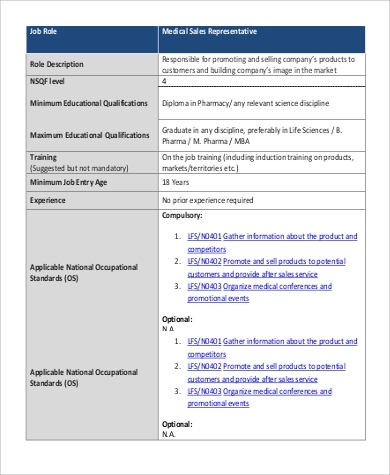 A good company with in-demand products will offer a salary plus additional bonuses and a car to their representatives. 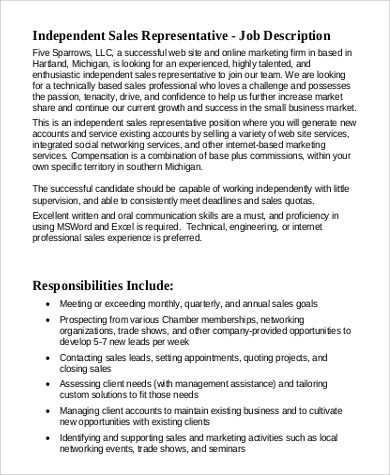 The job of a sales representative can be both exciting and a variable. Depending on the company that employs you, like that of a big pharmaceutical company, you could get to travel to different destinations. Some even offer really big incentives like that of a real estate company. Being able to sell a big commodity like a house and lot or several residential units can ensure big commissions equivalent to that of a company CEO. 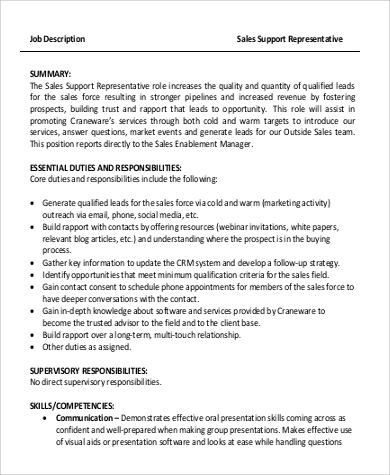 For companies looking to hire someone who oversees the functions and policies of sales representatives, our Sales Coordinator Job Description Samples are also available free for downloading and printing. 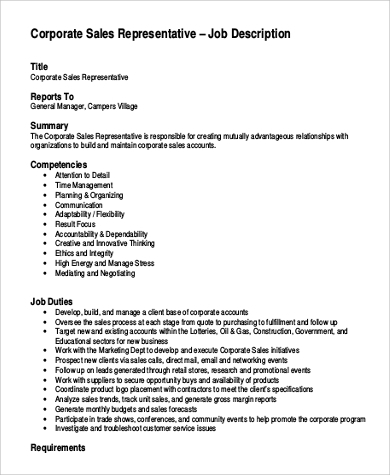 Sales coordinator tasks and functions are being highlighted in each job classification, and these can be downloaded in both Word Doc and PDF files.